Today's weddings are all about personalization. Brides are inserting their unique personalities into every element of the big day, adding amazing special touches that were never even imagined in weddings just five years ago. One aspect that you can really make a statement with is your wedding cake. There are as many options for making your wedding cake all about you as there are flavor choices. Infuse your wedding palette into your wedding cake! Here are six of our favorite ideas. For a special tribute, pay credit in your toast or on the menu to the family member you got it from . Mix and match flavors and colors. Tie the cake to your wedding palette. If you and your fiancé' have different favorite flavors, mix and match the different tiers with them. Include ethnic or cultural differences that are meaningful to you. Using specific ingredients or types of frosting and decorations can accomplish this. 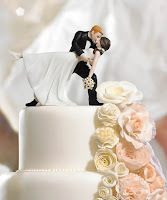 Many wedding cake tops are designed to be mixed and matched around cultures, ethnicity, hobbies, and more. Use your wedding dress for inspiration. Stage buttons or use the same lace pattern in the design of the cake and the table décor. Use an heirloom for your cake topper. Maybe your parents saved the cake topper from their wedding, or perhaps you can include a special item of your Grandmother's. Be sure to share the story. Whatever unique elements you include with you cake or cake table décor, don't forget to share the story with your guests. This can be done with table cards, included with the menu, or with beautiful signage placed near the cake. Incorporate Your Favorite Sport, Details from Your Wedding Gown, or Your Favorite Sweet Treat! There are so many ways you can personalize your special day - the options are amazingly endless. Use your imagination and have fun with it! There really aren't any limitations to what you can do. Who knows, you may start the next big trend with your fabulous idea. 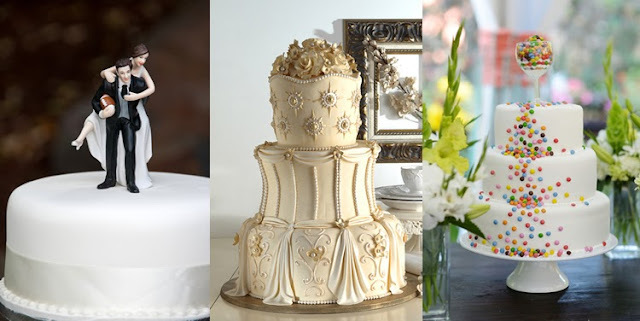 Take 15% off your wedding cake accessories AND your entire order at WhereBridesGo.com with coupon code WHATBRIDESLOVE, plus get FREE SHIPPING on orders over $100. Where brides go® ... for what brides love! For a great selection of affordable bridesmaid gifts, wedding accessories, and wedding cake tops, check out WhereBridesGo.com! For more ideas, wedding favors and accessories, check out WhereBridesGo.com!